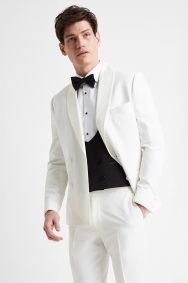 Tuxedos were traditionally white. 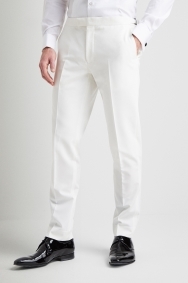 Today a white tux is seen as more dressed up than its black or midnight blue counterparts. 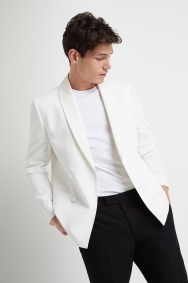 Moss London’s answer to the white tuxedo is in an on-trend double-breasted design. 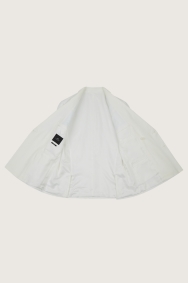 It has a formal look thanks to its shawl lapels and a two-by-two button design. 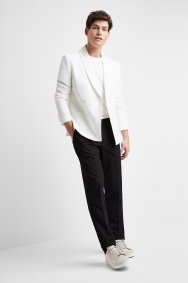 We’ve cut this tuxedo to sit close to your frame for a sharp outline, and added elastane allows for easy movement. 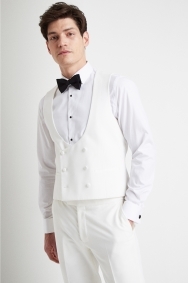 Complete the formal outfit with a white dress shirt and black bow tie. A simple t-shirt will relax the outfit.